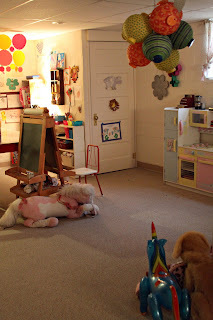 The next on my list for the 30 Bags in 30 Days Project was THE PLAYROOM, & FAMILY ROOM. And I don't know why, but whenever I clean these rooms, it is always VERY satisfactory. These rooms are connected, & right off the art studio in the basement. Everyone enjoys using them. The minute Zoey saw the cleaned up & tidy space, (I cleaned while they were sleeping or away at school), she screamed SO LOUD, & shook with happiness. It was quite a sight. haha! And of course the girls played the whole afternoon down there. I got rid of 6 bags of trash & 2 bags of donation items. Tally so far: 35 bags in 20 days!! I'm 2/3 of the way through: 10 days left!! What a great play room!!! I want one. 30 bags in 30 days sounds like a great idea. After mucking around making cards this weekend I realized that it just is so much clutter and since I don't have a designated studio (or my own play room) I do everything on the dining room table. I'm kind of bummed because now I don't know if I want to continue making cards. The table is still a mess and it's only me and the dogs at home so it's not like I have to clean it up..... but still. The playroom looks so cute- are those balloons or lanterns hanging? I know that whenever I get our basement cleaned up, the boys are down there indefinitely. It's like helping them rediscover what they already have. On the right side it's lanterns. Got 'em in the dollar bin at Michael's last year. Bummed they don't work---the light fixture is broken in all of them. :0/ On the left--those bright circles-- were cut from plastic school folders & connected with circle paper clips for a unique structure of sorts. Good for you! I wish I could be that methodical. I need to do a round of cleaning my kids rooms out again. Maybe I could do 10 bags in 10 days. Hi! Congratulation for all your Works. I really love ém all! Best regards from Spain! 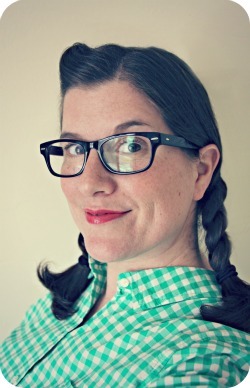 Okay, so what is your method for getting rid of stuff in a kids' room. I mean, what can they "let go" of? (I know doing it when they are away is the ticket, but a stay-at-home mom in a little house has few opportunities for that!) Do you have a certain "rule" for what stays and goes? The only method I really have is when the toys & things get out of control, the Mr. & I tell the girls they can only have "so many" stuffed animals. Or, only enough toys that will fit in this ONE bin, etc. Then, THEY decide. 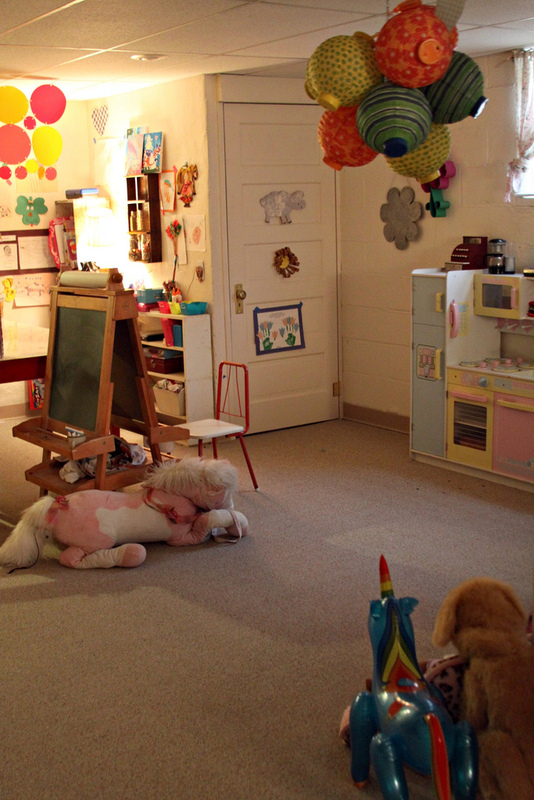 The playroom was different though--much easier to purge & organize than their personal bedrooms. Only because it has all our games & art stuff & magazines & books & I can go through that myself without needing their help. There's not really a lot of "toys" down there or personal things of the girls'.